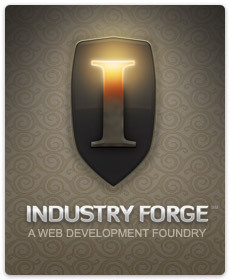 Industry forge is a Utah based Web Development Firm specializing in SEO ready and search engine friendly web design. We also have a great deal of experience planning, developing and delivering world-class e-commerce and web applications for our clients and partners—all the while focusing on the ever important factors of visitor conversion to customers. The founder and CEO, Peter Ehat, has been working in graphic design and web development for over ten years. He and his team of seasoned graphic design and computer science professionals and specialists have consistently delivered great products to our list of amazing clients. We have done business with companies and individuals ranging from CargoBay, one of the nation's leaders in storage and small-business professional office space, to Omniture, the worlds largest provider of online business optimization (i.e. web analytics). We also work and partner with individuals like Suanne Hoffman, Utah County's #1 selling real estate agent, and Dr. Adam Schwebach, with whom we created Health Prompts, an innovative text message reminder service. The list of satisfied clients goes on. At the core of Industry Forge's offerings is our promise of quality. We want to be the highest quality provider within our market space. We want to deliver what our clients need and want while providing excellent bend-over-backwards customer service. Mr. Ehat, began developing and understanding of web technologies as a web developer and designer for Brigham Young University (the nation's largest private university) where he earned his BA. Mr. Ehat started his first web services company called ZipSwitch during his time at BYU. Shortly before graduating, ZipSwitch was acquired by Lawrence Ventures, a small private-equity venture capital firm in Clovis, California where Ehat served as CTO. Later, Mr. Ehat moved to Fatbottomline, an internet marketing firm in Central California. Acting there also as CTO, Mr. Ehat worked with an extremely bright group of technology specialists and designers on some pioneering marketing softwares and development techniques using some of the latest systems, frameworks and technologies the industry had to offer. Before starting Industry Forge, Peter was blessed to work with the most talented group of SEO specialists in the world as CTO at SEO.com, a Search Engine Optimization firm based in Utah. There, he broadened his understanding of the technical side of SEO and on-site optimization, the importance of providing excellent customer service and a real commitment to quality—some of the characteristics that are at the core of everything we do at Industry Forge today. See what else can we do for you. Contact us now to talk to us about your next web development project.